Motorcycle accidents can result in some of the most serious and catastrophic injuries such as spinal injuries, brain injuries, loss of a limb, and sometimes partial or complete paralysis. 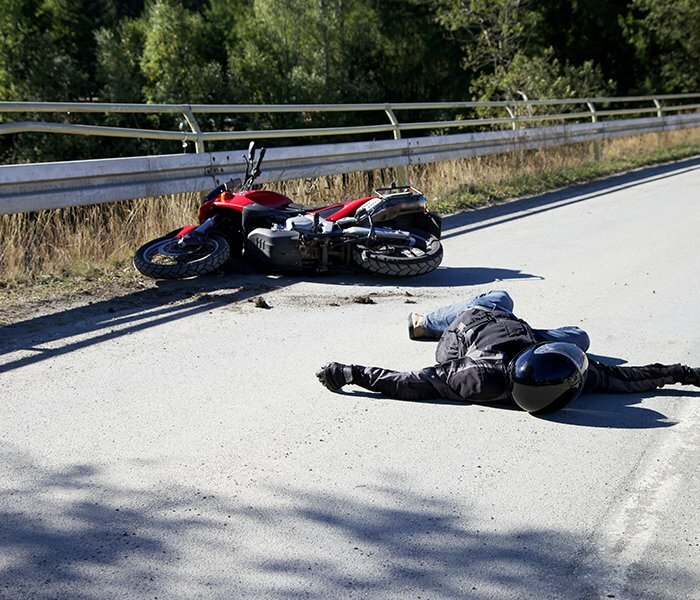 Motorcycle accidents often prove fatal to the motorcyclist or the pillion rider. New York City motorcycle accident attorneys, Frekhtman & Associates represent victims of motorcycle accidents within New York City, Bronx, Brooklyn, and Queens. If you or a loved one has been injured in a motorcycle accident, our personal injury lawyers encourage you to give us a call for a free case evaluation. Furthermore, if we decide to take your case, you pay us nothing unless we win a settlement for you. Cars: 9 cars out of 100,000 resulted in fatal crashes. Motorcycles: 58 motorcyclists out of 100,000 ended up in fatal crashes. Special dangers of riding a motorcycle in New York City. Compared to riders in the rest of the state of New York – those riding in NYC are almost twice as likely to die in their road accidents. If you or a loved one was involved in a motorcycle accident in New York, contact our experienced New York City motorcycle accident lawyers for a free consultation. We also litigate personal injury matters on contingency meaning our legal fee is a percentage of the amount we win for you and you never pay anything unless we win money for you first. In New York, the no fault law does not apply to motorcycles. This means that a motorbike accident victim must pay out of pocket or use their medical insurance to pay for medical care. 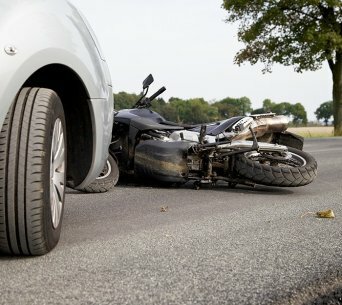 No Fault or Personal Injury Protection (PIP) benefits do not apply to motorcycle accidents as they do with people injured in automobile accidents. However, any out of pocket expenses incurred in paying for medical care, prescriptions, and other damages can be claimed as an expense and recovered in litigation. Motorcycle accident studies have found that in a majority of motorcycle accidents, the motorcyclist was not at fault in the auto-collision that caused the injuries. The personal injury attorneys at Frekhtman & Associates provide you with accident reconstruction analysis to understand how your accident happened in order to prove your case in court. Negligence is the failure of a vehicle operator to exercise due care which resulted in an accident, injury or death, when dealing with motorbike accidents. It is a very hard allegation to prove, but experienced New York City motorcycle accident lawyers that are skillful and smart should have no problems showing negligence by interviewing witnesses, correct documentation and compiling a case that will meet the correct standards for negligence. Also, if the accident happened due to a defect on the actual motorcycle, you may also be entitled to receive punitive damages from the supplier and/or manufacturer. Since most motorcycle accidents are very complex and more difficult to handle, it is imperative that you act quickly and find a lawyer to address any questions and/or issues that probably will arise so that you may get all the help that you are deserved. Facial injuries. These can be quite extensive when riders forget to wear full face motorcycle helmets or when their head gear comes off during accidents. Obviously, many factors play a role in every crash – including the various types of negligence caused by other drivers. However, as noted below, there are many precautions that experienced riders can take to increase their safety. Never listen to music while riding – and avoid all other forms of distracted driving. Finally, when planning to take an unusually long ride, always consider riding with at least one or two others so you can all watch out for each other on the road. Motorcycle passengers can require legal representation after an accident as well. One of the main issues they may face is which insurance companies to file claims with. For example, they might turn to the motorcycle driver’s insurance company along with the insurance company for the drivers of other vehicles involved in the crash. A New York City motorcycle accident lawyer can help with sorting out insurance issues, processing complicated claims, and fighting for sufficient coverage. Motorcycle passengers may also need representation in a personal injury lawsuit, or their loved ones may seek to file a wrongful death suit if they don’t survive. Having an experienced legal advocate on your side increases the chances that you will obtain the compensation you need to cope and heal after an accident. Motorcycle riders face dangers not only from other vehicles but also from surrounding conditions such as potholes in the road, bumps, construction on the road, construction debris, puddles, and other hazards. Motorcycle accidents are different from car accidents in terms of auto insurance. The New York State No Fault or Personal Injury Protection (PIP) laws do not apply to motorcycle operators. This means that a motorcycle operator injured in an accident cannot have their medical bills and lost wages paid by the auto insurance for the motorcycle by law up to $50,000 as with cars. However, the benefit is that a motorcycle operator is not limited by having to prove a serious injury in order to recover compensation in a lawsuit. This means a motorcycle operator does not have to prove serious injury or overcome any threshold of Insurance Law 5102(d) and therefore can sue for minor injuries, property damages, damage to personal items, medical bills, and any other damages arising out of the motorcycle accident. To learn more or get help with insurance, consult with the New York City motorcycle accident lawyers with our firm today. Immediately following your accident, it’s likely that a lot of confusion will be going on. You will first need to assess your damages and make sure you are in a safe location to handle the aftermath of the accident. Avoid staying in traffic and, if possible, move your bike to the side of the road. However, there are times when you will simply need to get away from the scene. For example, if a structure is on fire, or if you are near a dangerous drop-off, you will need to move to safety quickly. Calling 911 as soon as possible should be your first priority. Above all, you will need to stay at the scene and stay as calm as possible. Wait for law enforcement and rescue assistance. In the meantime, take as many photos of the scene and the damage to your property as you safely can. If possible, you may also want to draw a diagram of the accident and where the vehicles involved were located. This can be valuable evidence for your insurance company to use during their investigation. You should also make sure you exchange contact information with the other party and jot down the police report number, if available. With just about any accident, it is a good idea to go ahead and head to the ER to get checked out. Many of the injuries you receive from an accident will be masked until the next day or later. This is particularly the case with motorcycle accidents where you have little protection from injuries. A trip to the ER will help determine what injuries might have happened as a result of the crash. This is also an excellent way to document your injuries officially and gather evidence of them. If you skip this step, many insurance companies will be hesitant to reimburse you for any doctor’s visits at a later time. After everything is cleaned up from the accident, you will want to get the ball rolling as quickly as possible. It’s best to notify your insurance company as soon as possible. Even if the accident isn’t your fault, you will need to talk to your insurance company. There are times when the other party doesn’t have insurance, or when additional expenses might need to be handled under your policy. You will also need to start the claim process under the insurance company who will be paying for the repairs. So, this is another call you will need to make. Keep in mind, that most repairs and reimbursements won’t be able to get started until a police report is filed, but getting a claim started will save you time in the long run. Above all else, one of the most important things you should do after a motorcycle accident is not to rush the process of getting your bike repaired. All the damaged should be properly documented before any damage is repaired. You will also need to keep track of all your expenses related to your bike accident. This includes repairs, doctor’s visits and any rental charges you may incur due to needing a separate vehicle to drive. The Manhattan motorcycle accident lawyers at the F&A injury law firm have over 40 years combined trial experience litigating motorcycle crashes. Contact us for a free confidential consultation. If we accept your case, there is never an attorney’s fee or upfront payment of any kind. Our fee is a percentage of the money we win for you payable only after we win the case. Call (212) 222-1111 or fill out an online contact form to send us an email. If you’ve been seriously injured in a New York motorcycle accident, be sure to contact the motorcycle accident lawyers at Frekhtman & Associates. We have the necessary experience to help you get through the difficult injury settlement stage (or we can take your case to trial, if necessary). We always request the maximum amount of damages available for all your pain and suffering, lost wages, property damage, and medical expenses. We have a strong, proven track record for obtaining the highest compensation available for many of our clients.